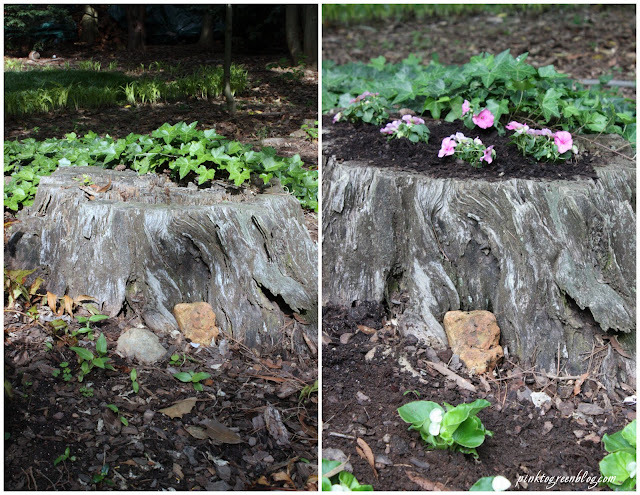 Hoping to disguise the tree stump next to our patio, we created a planter for some annuals. I can't wait to see how this guy fills in. April showers bring May flowers, right?! What do you have going on in your garden? Such a cute idea! I hope to have my own garden someday with herbs, vegetables, and flowers! Especially lots of basil and cilantro. Two of my favorites. This is such a cute idea! Love the rustic, natural look. Unfortunately, since I live in an apartment, I only have a few potted plants on the patio... someday I hope to have a huge garden!